Greenville Schools specializes in serving elevated fare like Alaskan salmon, Certified Angus burgers and St. Louis-style ribs. Greenville County Schools in South Carolina touches just about all the bases one would expect from a model K-12 meal program, from salad bars and the offering of unlimited vegetables with meals to a food truck and build-your-own food stations. But it goes an extra mile with some creative add-ons ranging from hydroponic gardens in its cafeterias to the menuing of premium seafood and Certified Angus Beef. The district of some 77,000 students—about half of which qualify for free or reduced-price meals under USDA guidelines—and 101 school sites serves about 80,000 school meals a day, the vast majority made from scratch or speed-scratch in 92 kitchens. 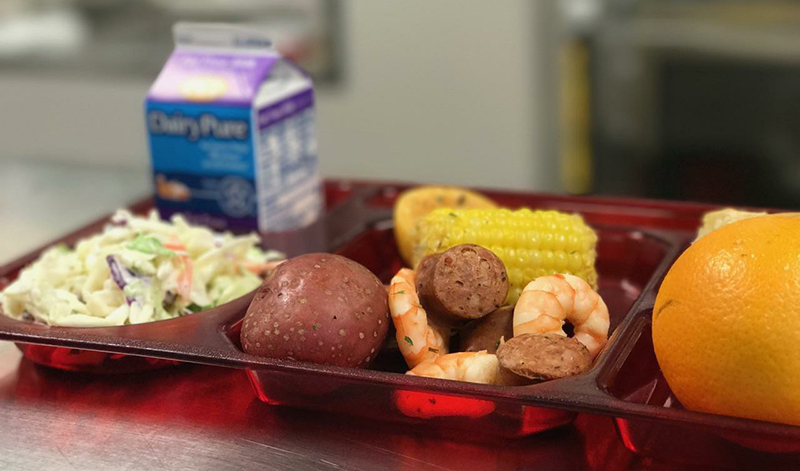 The Low Country boil's shrimp was locally raised in Buford, S.C.
• engaging students in a series of cooking competitions over the course of the school year to build interest in food and cooking. One significant challenge Urban faces is the extreme diversity of his district, which sprawls over about 850 square miles of rural, urban and suburban space and is characterized by pockets of extreme poverty and pockets of relative affluence: some schools have free/reduced percentages over 90 percent while others are near the single digits. That is a nice sentiment just about every school nutrition professional would agree with, but the devil is of course in the details of operating within the fiscal confines of federal school meal regulations. Urban has no illusions—“make no mistake, we are a business” that has to operate with sound business practices, he emphasizes—but also is a savvy businessman in how he runs the Greenville nutrition program. He says he has been able through the deployment of sound business practices to find funds by “freeing up resources that were kind of wasted before” to produce meals that might otherwise only be expected in programs outside the National School Lunch Program (NSLP) where meals could be more priced to market. “By operating our business using sound business practices, we’re able to control our food and labor costs and we’re able to dump that money back into better food and thus develop menus that are districtwide and use only the highest quality products. The 92 system kitchens are all fully functional—the handful that lack them get satellited meals—and the choices range beyond the fare typically associated with K-12 foodservice. Among the highlights is a partnership with a nearby ranch called Brasstown Beef that markets humanely raised, completely antibiotic-free cattle from which Greenville gets fresh (never frozen) ground beef used in all of its scratch-made recipes. And just this fall Urban was informed that his program would be the first school district in the nation to be licensed to use Certified Angus Beef, which will now be used exclusively to make the system’s burgers at all sites—every day at the middle and high schools and once every three weeks at the elementary sites. 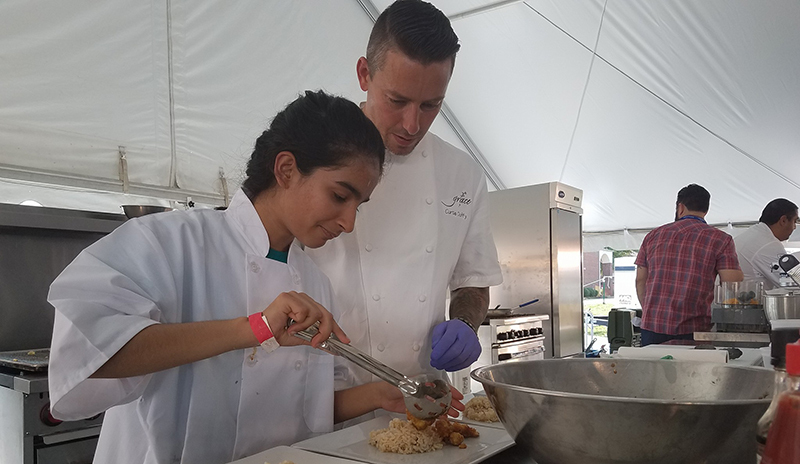 An annual cooking contest pairs district youngsters with a celebrity chef like Curtis Duffy (pictured here) who serves as their sous chef, with the winning dish going on the school menu. The high schools and middle schools also have regular and spicy whole-muscle chicken fillet sandwich on the menu every day and a pizza and two composed salads, with options ranging from tuna, Cobb and Caesar to crispy chicken and Buffalo chicken with real blue cheese. Build-your-own food bars featuring customizable dishes like mac and cheese, mashed potatoes and tacos rotate at all sites—there’s also a chicken wing bar limited to middle and high schools—to accord with perceived trends, Urban says. Potential additions to this program include a ramen bar if the logistics of getting kids through quickly enough can be addressed, and a burger bar with the Certified Angus Beef burgers as a protein option alongside turkey and seafood (either salmon or Alaskan pollock), plus choices of buns and toppings. Urban is a big believer in using lots of options to keep up participation. His middle and high schools typically have seven to nine basic entrée choices, and the elementary schools have three or four, but the food bars allow even that already impressive range of choices to increase because of the many customization choices they represent: “there’s probably at least nine different ways to make a taco on our taco bar,” he notes. The higher end seafood choices like the salmon and pollock—he has also menued rainbow trout and mahi-mahi—represent Urban’s determination to increase the consumption of quality fish products because of their health benefits. His commitment extends to serving as the first ever ambassador from the K-12 schools segment for the Seafood Nutrition Partnership. “Kids don’t eat enough seafood,” Urban says, citing seafood’s many benefits, particularly on brain function. He notes that the idea that kids won’t eat seafood other than fish sticks is contradicted by his experience both as a commercial restaurateur and now in school foodservice. As evidence, Urban notes that catfish is on elementary school menu rotation and an Alaskan pollock fish and grits dish made with an unbreaded 4-ounce filet is one of the most popular items served in the middle and high schools. If it weren’t, it wouldn’t be on the menu, he adds, explaining that all items are constantly monitored and validated by a certain level of acceptance: “If it remains on the menu, that means the kids are accepting it at a rate we are happy with,” he says. There is some a la carte in the high schools and most middle schools, including a branded Papa John’s pizza program available every day “that our local Papa John’s franchise developed just for us,” Urban says. The pizzas have whole-wheat crusts, low-fat cheese and low-sodium sauce and mimics the chain’s street pizza “very well,” he stresses. The a la carte program helps boost participation in high-cash sites as students drawn by the pizza will often supplement it with fresh produce from the salad bar that is a staple of every Greenville school site’s offerings, including up to half a dozen fresh fruit choices. 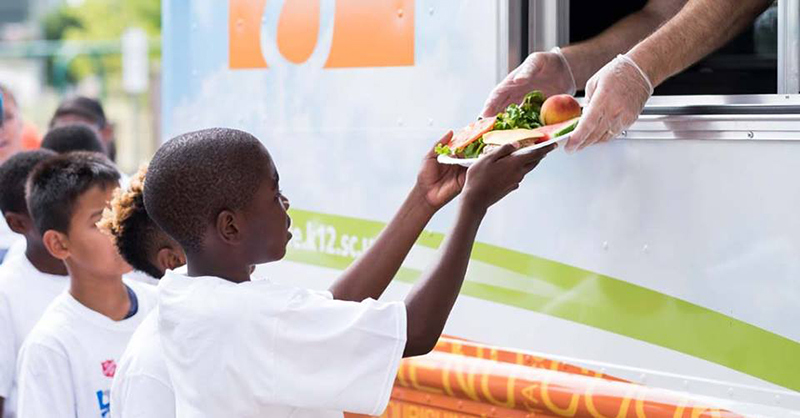 The district’s food truck debuted in the summer of 2016 to extend the reach and effectiveness of the summer feeding program. This past summer it was serving more than 500 meals a day at three or four daily stops, mainly apartment complexes with high concentrations of impoverished kids who can’t easily access the fixed summer feeding sites. Once summer was over, the truck transformed into a special event platform deployed either to serve as a reward—it recently made a stop at one middle school to serve alligator Creole to about 140 students who made honor roll—or provide a pop-up-style serving station from which potential new menu items, such as a newly developed chicken and waffle dish, could be tested. Urban adds pizazz to his program with special events like one that supported one school’s local history lesson with his food truck. One thing the truck is not used for is to cater after-hour and weekend events. 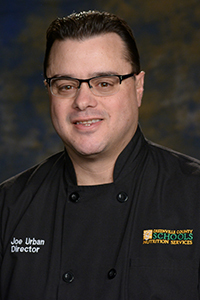 Urban’s background has allowed him to forge connections with chefs from around the country, some of whom have come to Greenville to help promote not just the school nutrition program but also the culinary arts and healthy dining. One of the highlights of the year is a kids cooking contest held each September for the past three years during the city’s annual Euphoria Greenville food/wine/music festival, which draws numerous noted chefs from around the country due at least in part to the nearby presence of the Michelin World Headquarters, home of the famous restaurant rating service. The contest pairs the young contestants with celebrity chefs who serve as their sous chefs. This year, in a veritable galaxy of collective Michelin stars, the chefs included Curtis Duffy from Chicago (Grace) and Dominique Crenn (Atelier Crenn) and Michael Mina (Michael Mina) from San Francisco. The winner’s dish is added to the school lunch menu. This year it was an Indian/Asian street food fusion dish called gobi manchurean centered around spicy battered cauliflower, while last year’s winner was penne pasta pie with chicken, “probably one of our student favorite dishes at this point,” Urban notes. Celebrity chef connections also sometimes help support the district’s academic programs. For example, last spring Anthony DiBernardo (Swig & Swine BBQ) and Johnny Carino (Carino’s Italian) joined Urban for a cooking event at one of the Greenville elementary schools where the third-grade class was studying traditional Carolina cooking. DiBernardo ended up slow-smoking a whole hog at the event while Carino used his seafood expertise to make a seafood Low Country boil with locally raised shrimp from Buford, S.C. The pulled pork and Low Country boil were the lunch options that day at the school for not just the students but parents who joined them. The Carolina cooking event was just one of a number of special events Greenville Schools’ foodservice department participated in. Another was a trout luncheon that supported a conservation program that saw students raise and release trout into the wild. “The kids got to see the fish from tadpole to release to on their plate—it was really a kind of cool thing,” Urban says. The Low CoConservation lessons also come in several cafeterias with onsite tower gardens, vertical hydroponic systems that grow herbs and microgreens for use in salads and as garnishes. The first one was implemented at a school that already had a fairly robust outdoor garden that was already sending some of its bounty to the onsite kitchen. “We thought it would be a good idea for them to do some indoor growing,” Urban offers. It was particularly fortunate that the cafeteria manager at the site is also a farmer with a 25-acre spread, “so she’s a great resource for us to have on hand,” he notes. Local produce is also sourced on a much larger scale from a couple of sources: primary produce supplier Marvin’s Produce and a group called ASAP (Appalachian Sustainable Agriculture Project), a nonprofit that connects farmers in the region to restaurants, retailers and other volume buyers, including the Greenville school system. The local emphasis means more seasonality and short notice on what’s available, which doesn’t bother Urban because it just means his program is getting the freshest product from close by when it is ripe and lowest priced.